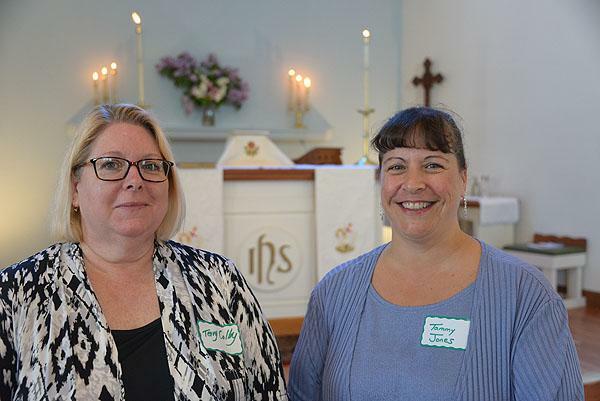 In 1997 Carolyn Sundquist and Linda Siracusa were the original teachers for the All Saints Preschool. Terry Colby Moody joined the staff the second year. In 2000 Tammy Jones joined with Terry and provided a wonderful nurturing and teaching experience for preschoolers. 2017 is the final year for the preschool, and Terry and Tammy were honored for their long ministry of teaching at the 10 AM Service, May 21, 2017. Linda Siracusa and Carolyn Sundquist were also honored for their leadership to the Preschool. A video of the this service segment may be found by clicking here. In the photo below, Rev. Petersen thanks Carolyn Sundquist, Terry Colby Moody, Tammy Jones, and Linda Siracusa for their devotion and dedication to the All Saints Preschool. Rev. 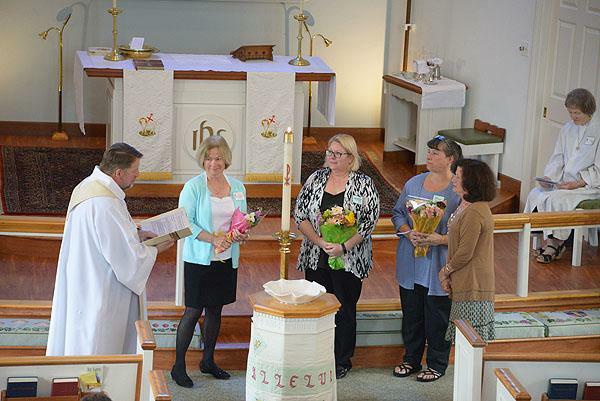 Petersen prayed that, "the transition from their faithful service among the children of our community that you may continue to receive and share God's gifts." Rev. Petersen finished by stating, "Linda, Carolyn, Terry, and Tammy, as you end your service and we end the ministry of the All Saints Preschool, we wish to bid you farewell."